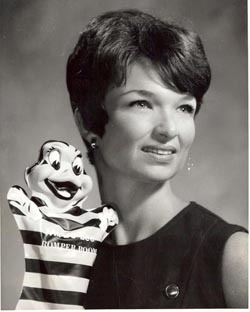 Connie Hindmarsh developed her love of Teddy Bears as a former television hostess of Romper Room. She appeared with Captain Kangaroo & Howdy Doody, as well. She holds Bachelor of Science and Master of Arts degrees and was the director of performing arts and a master teacher for a large public school system. Now a well-known Bear, Hare and Doll designer, Miss Connie’s patterns, videos and creations are sold world wide. She has been married to Bert Hindmarsh, her college sweetheart, for 50 years. They enjoy their children, grandchildren and each other.